Do you sell toner waste bottles for Canon IRC5235i? Unfortunately we only sell the toner cartridges for this machine. Sorry we can not be of any more help. The Canon IR-C5235i is aimed at busy and large workgroups that are looking for a reliable multifunction device to streamline their workflow and improve document management without compromising the environment, security, and running costs. The Canon IRC5235i office colour printer is praised for fast print speeds, generous paper capacity, and user-friendly operation, but some users might be disappointed with the expensive price, which does not justify the absence of some potentially crucial features. The size of this all-in-one device is good for small to medium-sized offices (1082mm tall and 620mm wide). The Canon imageRUNNER ADVANCE C5235i printer runs on 2.5GB of memory with a 1.8GHz processor. The interfaces include high-speed USB 2.0, Ethernet, and a USB 2.0 host, while the main operator panel stands out because of the 8.4-inch colour LED backlit touch-screen display. In-house document publishing and secure printing per user are supported features of the Canon IR-C5235i colour laser printer. The IR-ADV C5235i prints in colour, at up to 30ppm speeds, while monochrome documents are ready in speeds of up to 35ppm. The colour touch panel can be tilted for more comfortable and easier operation. The Canon IRC5235i multifunction printer is also praised for versatile finishing capabilities and media handling. This is a large and heavy device. 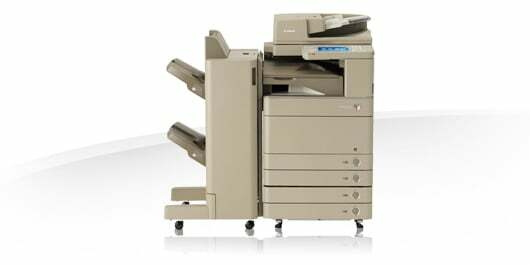 The Canon IR-C5235i photocopier requires 1164mm deep and 850mm wide installation space with the cassette drawers and multi-purpose trays opened. It is expensive to purchase and potentially pricier to upgrade with optional features. Super G3 33.6Kbps fax is only an optional feature for the Canon IR-C5235i.